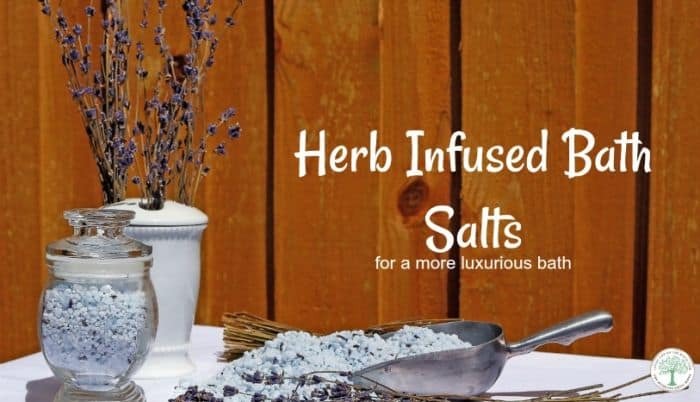 Adding bath salts to your bath can be a very relaxing experience. Some say they are “detoxing” and assist the body in releasing toxins. It may also help to reduce inflammation while softening skin. But, let’s step it up a notch, shall we? jojoba oil (available here) or you can also use olive oil. Begin by placing 1/4-1/2 cup herbs in an oven proof bowl. Cover with jojoba oil. There may be a bit of herbs above the oil at first, but that’s totally okay. Place in a 250° oven for 2 hours to allow the herbs to infuse into the oil. Gently place the herbs and oil in a cheesecloth to drain into another bowl. Squeeze the herbs a bit to get all the oil out. Mix the infused oil with 2 cups of the bath salts and shake well. Add 1/2 cup of the salts to your next bath. Some final words of wisdom. Or caution, if you’d like. Your bathtub will be more slippery as will your feet, due to the extra oil. You need to be very careful getting out of the tub after using this. We keep an extra towel nearby that we place at the bottom of the tub as the water is draining to provide some slip resistance. You don’t want to use this more than 2-3 times a week or you may find your drains clogging up. You know your drains better than I do, so just keep that in mind. There isn’t a whole lot of oil in this recipe, and much of it will be on your skin, but just a heads up. Do you use bath salts? What combination of herbs will you try for your next bath? Be sure to pin this for later! Wow, I love how easy this is using the oven at a low temperature. My daughter would love this! She does ballet and comes home very sore…plus all the spring gardening has everyone moaning about soreness, lol. Using arnica flowers sounds exciting. Thanks for sharing this. I want to get in a bath and soak right now! What a great combination of herbs. Soaks are so amazing for sore muscles!! I love the herbs you added to this! Bath salts are my favorite, having a nice soak in the tub is so relaxing + good for your body. I need this after my long runs! I am pinning for later. Love love love this- thank you. I need some muscle relaxation in my life right now! This looks wonderful. I am a great believer in striving for balance…and this is a super way to relax…body, mind + Spirit after a busy day…in the garden..
..still dreaming of Spring here.. Thanks for sharing!